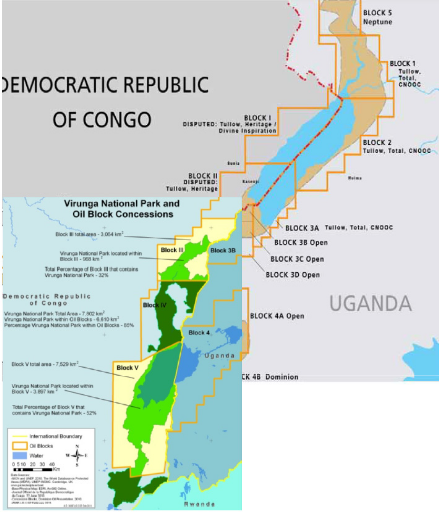 In 2010, the Congolese Government of Kinshasa granted concessions to European companies to exploit oil near the border with Uganda. Exploration is only starting now in a context of civil war. But the area includes one of the world’s most exceptional nature reserves: Virunga National Park. Energy versus wildlife: the same story once again. The EU is financing a cost-benefit analysis to decide on a way ahead, but one conclusion is already clear: exploration is needed to determine if exploitation is a good idea. Hughes Belin reports. This is another story where an industrial project threatens the environment. It’s about an oil lake under the ground of Africa’s oldest national park. Created in 1925, Virunga National Park is located in the north-east of the Democratic Republic of Congo (DRC, formerly Zaire, also called Congo-Kinshasa). It could become the symbol of nature’s resistance to our rush to wealth, ever scarcer natural resources, and the industrialisation that destroys our planet. While the Australian government debates the possibility of digging for more coal and destroying its Great Barrier Reef, Virunga National Park echoes the same issue in Africa: the fate of UNESCO World Heritage sites in a world of growing energy demand. The best way of describing the DRC from a resource point of view is found in the introduction of a book by French journalist François Misser on the Inga hydropower dam: when Belgian engineers arrived in Zaire, then a Belgian colony, they described the country’s geology as “outrageous”. The same can be said of its biodiversity, of which Virunga National Park is a microcosm. The park was listed as a UNESCO World Heritage site in 1979. It is known for its exceptional wildlife-rich forests, savannahs, rivers, lakes, marshlands, active and dormant volcanoes, and permanent glaciers. It is also famous for being home to about 200 critically endangered mountain gorillas and okapis, an endemic species of giraffe. At the same time, the DRC government is very committed to exploring its subsoil and seems ready to exploit oil at any price. According to a report from local think tank the Pole Institute, the Albertine Rift, the portion of the Rift Valley around Lake Albert on the Ugandan-Congolese border, “is regarded as the most promising sector for oil exploration in the Rift Valley”. In neighbouring Uganda, there are at least a billion barrels of oil in the ground. The exploration success rate is set at an unprecedented 90% and costs less than $1/barrel – compare that to a world average of $5-25/barrel. The same oil basin crosses the border into DRC and this country wants its share of the bonanza. Unlike its neighbours Uganda and Congo-Brazzaville, DRC has not yet tapped into its supposedly huge oil potential. But how much can be expected from this oil basin? So far, efforts are focusing on exploration to answer this question. The problem is that international law forbids entry into a World Heritage site for this kind of activity. So the DRC government, as stated in a letter to UNESCO from its Environment Ministry on 4 August 2012, is ready to change the law and “downgrade partially or entirely the National Park of Virunga in favour of oil exploration”. In neighbouring Uganda, the oil exploration success rate is set at an unprecedented 90% and costs less than $1/barrel – the DRC wants its share of the bonanza. And that’s not all: the DRC is also reviewing its hydrocarbon law to enable the government to authorise by simple decree oil activities in protected areas. In an analysis of the draft law earlier this year, NGO Global Witness said it “would severely undermine the legal protection of Congo’s World Heritage sites, which are already being targeted by oil companies”. It warned: “This loophole could allow some of Congo’s most pristine ecosystems to be ravaged by oil exploration.” The law will be examined by DRC’s Parliament in September. A coalition of local civil society organisations has proposed including a provision to make sure World Heritage sites remain untouched. UNESCO has expressed “deep concern”. Already last year, the World Heritage Committee called on the DRC to “revise its authorizations and not to grant new authorizations for petroleum and mining exploration and exploitation within the [park’s] boundaries”. At its annual meeting in June this year, it adopted two decisions (7A.4 and 7A.9) on the DRC case. 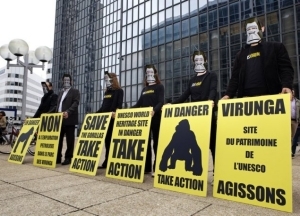 UNESCO called on the government to explain its hydrocarbon law by 1 February 2014 and decided to keep Virunga National Park on the “List of World Heritage in Danger” (on which it is since 1994). The Virunga case has attracted international attention right from the start, not only because it involves UNESCO but also because it involves several foreign oil companies. Since 2010, Total (France) and SacOil (South Africa) together hold a concession on “Block III” and SOCO (UK) holds a concession on “Block V”. They are associated to various degrees with La Congolaise Des Hydrocarbures, DRC’s state-owned oil firm. In total, 85% of the 7,844-km2 park has been designated for oil concessions. Last year and again this year, the World Heritage Committee urged Total and SOCO to publicly commit to not entering any World Heritage site, as the International Council on Mining and Metals (ICMM) and Shell did in 2003. Pressed by WWF in France, Total’s CEO Christophe de Margerie publicly pledged at the company’s annual shareholders’ meeting last year, that Total would not conduct exploration operations in Virunga National Park. Following rumours that the Congolese government was preparing to displace the park’s current borders, he said on 17 May this year: “[Total] confirms its commitment to respect the current limits [of the park] in case they would be reduced”. Total “doesn’t exploit nor explore in any” World Heritage sites today, de Margerie added. In March 2011, DRC Environment Minister José Endundo decided to withdraw SOCO’s exploration permit, pressed by NGOs. But newly reinstated a year later, he performed a U-turn, explaining that the government needed to assess the region’s oil reserves to decide whether to allow exploration in the park. This was the start of an international back-and-forth on the issue: Belgian Foreign Affairs Minister Didier Reynders exchanged letters with his British counterpart William Hague. In September 2012, DRC Oil Minister Crispin Atama Tabe said: “We’re going to evaluate the quantity of the deposit. If it’s very significant we’ll compare the value of the park with the oil… We’ll see whether we’ll respect the park or not. It’s up to us.” The British Foreign Office reacted by “informing” SOCO and urging the DRC government to “fully respect the international conventions to which it is signatory”. By mid-December, the Belgian Parliament had adopted a resolution calling on DRC’s government to cancel all permits for oil activities in Virunga National Park. On the same day, the European Parliament adopted a resolution pointing to the illegality of oil concessions granted in the park. Finally, in May 2013, Dirk Niebel, German Minister for Cooperation and Development, wrote to Joseph Kabila to warn him that Germany would not pursue its development cooperation if the oil agenda went ahead as planned. In June, the German Parliament adopted a resolution pointing out the dangers of allowing oil exploration and exploitation in Virunga National Park. In parallel, NGOs have been restless to denounce the oil threat to the region. WWF, which manages environmental protection projects within the park, coordinates the NGO campaign, including through a dedicated blog. There is another, human element to all of this. Already back in 2002, the Pole Institute pointed out that “the economically most interesting part” of concessions granted at the time was “the scene of some of the worst fighting in Congo’s war: part of Ituri and the northern part of North Kivu”. The area including Virunga National Park is today occupied by various rebel groups. A report published by the International Crisis Group in July warned that a major oil find “would exacerbate deep-rooted conflict dynamics” in the eastern part of the DRC. The allure of windfall profits for the DRC remains however, and its political leaders will not be easy to dissuade. The DRC Government wants to reconcile rational economics with sustainable resource management and “convert potential into effective resources, in the long-term interest of its population”, it wrote in a letter to UNESCO in August 2012. More simply, SOCO “believes that development and investment [in oil] can contribute to the DRC’s ability to produce and supply its own natural resources, helping to stimulate the local economy, create jobs and increase up-skilling”. “A successful oil project has the potential to transform the economic and social wellbeing of a whole country”, it concludes. But no oil company or the government has yet supplied any figures on the alleged economic and social benefits that big oil should bring. It is for this reason that the EU has decided to finance a Strategic Environmental Assessment (SEA) “to establish scenarios for the authorities and population [of DRC] to… reconcile the protection and valorisation of the park’s natural assets, as well as the legitimate aspirations of the people to have better living conditions”, explained EU ambassador to the DRC Jean-Michel Dumond in April this year. No oil company or the government has yet supplied any figures on the alleged economic and social benefits that big oil should bring. The study is being carried out in two phases: a framework study (€200,000; finished in late 2012) and the full SEA (€500,000). Its terms of reference are currently being finalised with the “active” involvement of the Congo Environmental Study Group (GEEC), responsible for coordinating all environmental impact assessments within the DRC’s Environment Ministry. Once it is received by the EU Delegation in Kinshasa, this body will organise a consultation with all interested stakeholders prior to launching the tender, the European Commission told Energy Post. Fair enough, but how to assess the oil potential without actually exploring? To carry out the SEA, “it will be necessary to dispose of trustworthy information on the exploitable oil resources in the park’s subsoil”, acknowledges the framework study. “There is no alternative to land- and lake-based seismic technology.” It admits implicitly that exploration would have to take place within the park, even listing potential impacts (and how to mitigate them) on ecosystems. The EU-financed study admits implicitly that exploration would have to take place within the park, even listing potential impacts (and how to mitigate them) on ecosystems. WWF submitted its own evaluation of the value of Virunga National Park in a study unveiled on 1 August, drafted by international environmental and social consultancy Dalberg. The study values the park at $1.1bn/year, including $348m/year for direct use (tourism, fisheries and hydropower), $63.8m/year for indirect use (carbon sinks, water supply and erosion control) and $700m/year for non-use (knowing that the park’s resources can be used in future). WWF used the Total Economic Value (TEV) method, “a widely-used instrument to value ecosystems”. The clock is ticking. Due to administrative delays, the SEA has not yet started. The general security situation remains very bad in the area. But SOCO also recently emphasised that the “shared reservoir… could be drained from the Ugandan side”, urging the DRC government to go ahead despite strong international pressure. WWF’s study gives a first indication of the economic value of the park, but it may not be enough to convince the DRC to break off its oil agenda. Has the EU opened Pandora’s Box and cornered defenders of the park by proposing to quantify all options? Maybe, but maybe the SEA is also the only chance of proposing a rational alternative to oil exploitation within Virunga National Park. The last word remains with the DRC’s top politicians. And here, there is plenty of cause for concern on the back of lack of transparency in the attribution of concessions to oil firms so far. 3) Oil exploitation and creation of a sovereign green fund fed by a percentage of oil revenues in Ituri, an oil moratorium in northern Kivu, and valorisation of the ecosystem services of Virunga National Park integrated into a provincial investment strategy. The third one probably has the best shot of making everyone happy and saving the park, provided DRC can ensure the necessary environmental monitoring.